Not a big fan of lamb burgers, and having just had a baa'd lamb bao at Egmont Street Eatery earlier, I was quite hesitant about going to Beer Meats Grill (BMG). However, I knew they did a great burger so I thought it was worth a shot for sure. Plus it was a solo trip so if it was disappointing, it would only be me. Fortunately, my intuition was right. BMG does do good burgers. They actually made me like a lamb burger. Just looking at the picture you can probably see why. 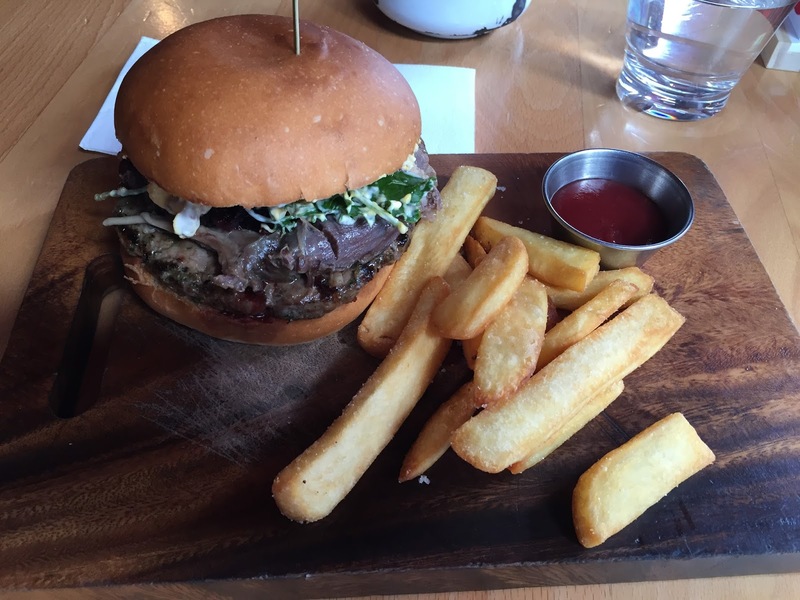 It was a damn good looking burger. I spent a fair while just admiring its construction. 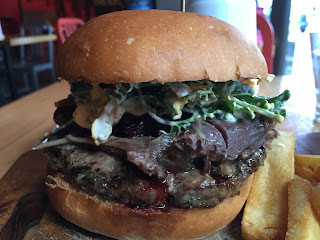 A solid lamb pattie, a big handful of pulled lamb shank, beetroot, and then the aioli/baby kale mess. I wasn't sure I could cut it in half, but gave it a go. This gives you a better idea of the ingredients as well as a first look at the bun, which I might add, was the right choice for this burger. The burger definitely announced itself as lamb. The shank was great. Rendered gristle and all. The patty was less memorable and reminded me why I don't like lamb so much. It had a fair bit of herbs and spices, giving off a fair bit of heat. It was my least favourite ingredient in the burger. The beetroot added a bit of sweetness, which I think is good with lamb. What made the burger sing though, was the aioli/feta/roast pumpkin/pine nut salad. It was almost like an egg salad consistency but tastier. Baby kale. Now that has to be a gimmick right? Make the burger appear healthy or something? It definitely changed the texture a bit and it wasn't offensive. It was a bit like having parsley in the burger. While I only got a couple of chunks of roast pumpkin, which were nice, the pine-nuts were scattered through and definitely made the burger unique - in a good way. All in all, this was a great effort at making a lamb burger work. Something that even McDonald's couldn't do. It was well thought out, and the ingredients all worked with each other. 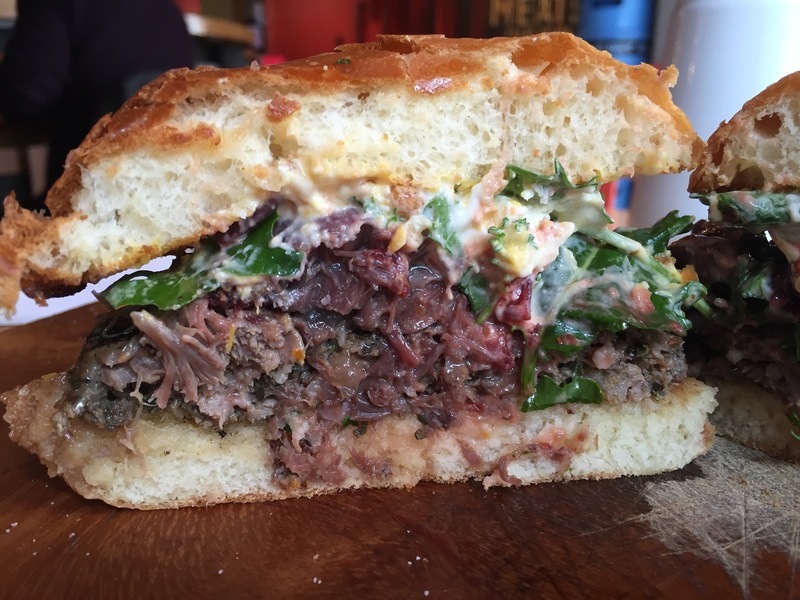 Solid burger-ability, even with all that lamb-shank. It wasn't overly messy, which is where the bun did such a good job of holding it together and absorbing some of those juices. Sufficiently moist but not much burger juice. Pricewise, it was well worth the $20, even if they didn't throw in the fries, you wouldn't feel fleeced. A solid 8/10 and worth getting to before the end of WOAP. Potential contender for top 5.